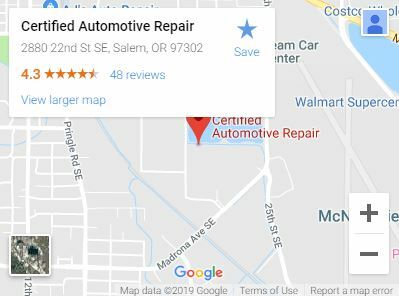 Certified Automotive in Salem, OR has you covered! Getting the most out of your car requires scheduling your vehicle for regular inspections and maintenance. While every make and model has a different recommendation for how often you should schedule inspections and support for your car, drivers should always set aside time to keep their car tuned up and performing correctly. At Certified Automotive Repair, we take our business seriously for car inspection Salem OR drivers count on. This includes inspecting tire tread, pressure and tire wear. We also rotate tires and check your alignment. We check your power steering and fluid levels, along with the power steering belt and power steering pump. We check your battery’s voltage, secure battery tie-downs and conduct a load test. We make sure your headlights, brake lights, hazard flashers, and turn signals are working as intended. We inspect your brakes for any wear and tear, plus monitor brake fluid levels. Wiper blades should always be replaced after a year of use. We have windshield wiper blades for most makes and models in stock. Check Engine Light, leaks, damage and maintenance check will be completed. Need A Basic Vehicle Inspection? Come to Our Shop Today! You have questions about your car, and we have answers. We won’t pressure you into spending hundreds of dollars in unnecessary repairs. Instead, you’ll get upfront explanations about your car, and honest estimates for any damages that we might find. Our skilled, ASE-Certified mechanics have the expertise to keep your car running the way it should. Bring your vehicle to our automotive repair shop, and we will take care of your vehicle with quality service at a reasonable price.